If there's a spot that doesn't get enough attention when it comes to organization, it's could well be the kids' playroom. Sure, some little ones are organized by nature. But because more of them would rather scatter Lego bricks across the floor than pick them up, keeping organization simple can help you win the battle. It can also save you the incomparable pain of stepping barefoot on another tiny plastic brick! Getting the playroom organized with a great system helps on many different levels. It teaches children responsibility and makes tidying up easier. And if your kids play in a family room where toys are decidedly not decorative, good storage helps keep the room clutter free and enables secondary utilization so people don't have to see a mess of toys. Here are a few ways that you can corral all of the mess, teach good habits and keep a safer playroom, too. You want kids to be able to access some things easily. But other things should be safely kept away from curious little hands and eyes, only to be used with parental supervision. With a complete organization system, instead of a few random storage pieces, you can have the best of both worlds. You'll also minimize the risk of climbing to find a favorite toy. Plan your home storage system in sections or groupings to make the most efficient use of space. Lower areas should house the things that kids play with often and get to themselves. Special care has to be taken to make sure that there are no lids on toy chests, for example, that could come crashing down on little fingers. Higher areas where they can't reach could contain art supplies and other things that require more supervision. Behind locked doors, if necessary. Also, kid sized tables or work surfaces can be added for puzzles, drawing, painting, and other projects that might otherwise damage the kitchen table. 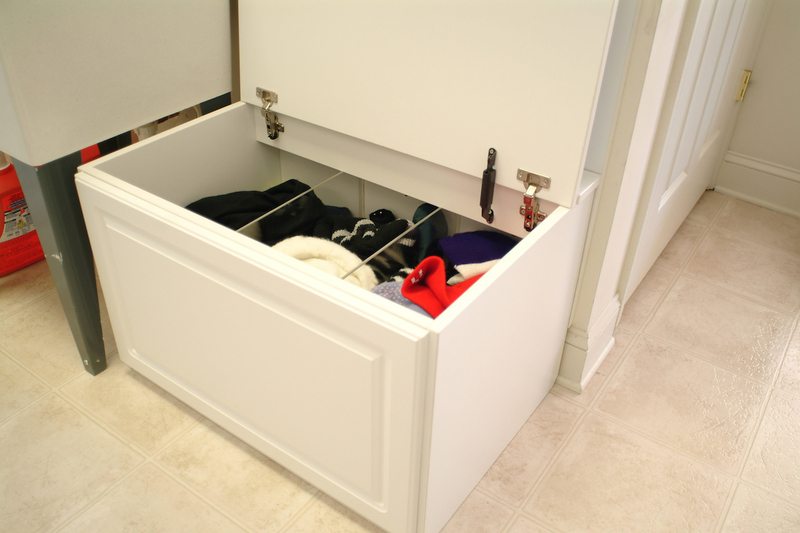 The Closet Works can help you create efficient home storage solutions that look beautiful, function brilliantly and hold up to the rigors of child's play. Your designer will come to your home, measure the space and then work with you to create something that just plain works for you! Cubbies are a classic way to store things within your kids' reach. That's why they're an elementary school staple, and they'll also work great in your home. A set of these convenient, open cubes lets your children reach books and toys and put them away again easily. Alphabetize the cubbies, as Buzzfeed recommends, and you've got a built-in learning tool. Toy chests can serve two purposes. First, they contain a mountain of playthings. And second, they provide seating for reading a book or putting on shoes, especially if you put a cushion on top. Safety is a major consideration here, as a toy chest lid could slam shut and hurt small fingers. Opt for one with a safety hinge that closes slowly. And for other things that you don't want kids to access, think about cabinets with locking doors, some of them situated high and out of reach. If shelves are easily accessible, and kids might find them inviting for a climb upward, it might be a good idea to cover them with doors, which also keeps everything inside hidden from view. HGTV says that with built ins like these, your child's play space can grow with him or her because shelving is adjustable and as needs change so can the configuration. The Closet Works can help you create an organization system that contains everything that your kids play with and encourages tidying up. And with a myriad of styles and durable finish options, you're sure to find the right combination that looks as great as it is durable. Talk with one of our designers today to learn more about playroom storage that fits your lifestyle as well as your budget. We pride ourselves on building the best at affordable prices. Schedule a free design consultation today.